Tom Attwater has a terminal brain tumour and has written his step-daughter Kelli a moving letter of advice and guidance that he won't be around to give her in person. From talking about boys and marriage to school and self-belief, family and learning to drive, his letter is so much more than just a goodbye note. His stepdaughter Kelli, five, has already had cancer twice and has managed to fight it off, but in the future she may require treatment in America because there's a high chance she will relapse. 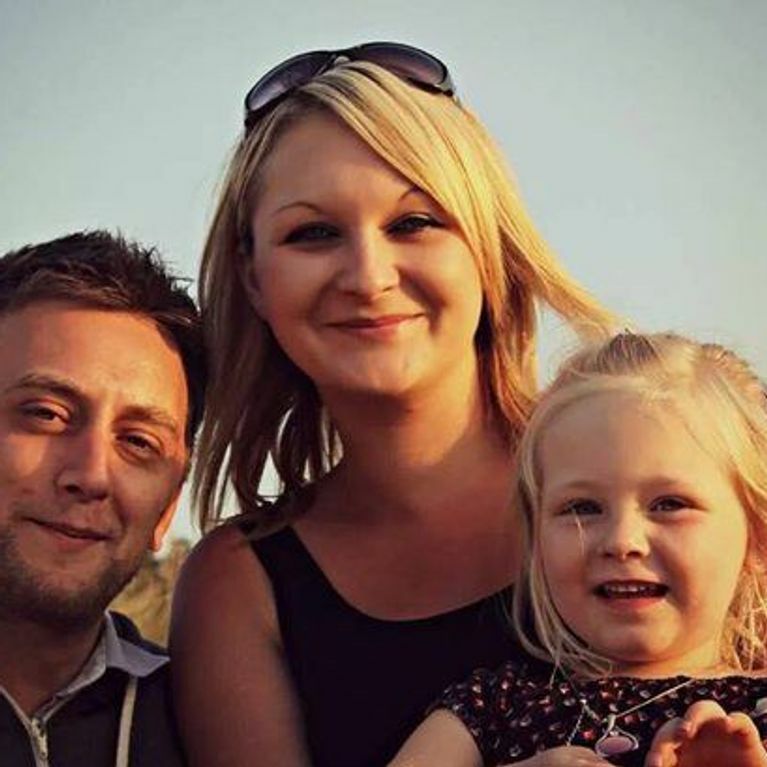 He has been raising money to help save Kelli's future even if he is unable to save his own. I’m so sorry I will not get to see you grow up as I so want to. Please don’t blame people or the world for this. A lot of life is simply luck and mine is running out.I wish I had the words to make you feel better. I wish I didn’t have cancer and you didn’t have to see me in pain as you often do now. I wish so many things were different but they are not.Most dads and daughters have decades to chat around the kitchen table, their hands warmed by mugs of coffee, as the dad dishes out advice and their girls no doubt roll their eyes. We don’t have that time. I won’t be able to drop you off on your first day at big school, pick you up after your first date, hold you when your heart hurts or cheer when you graduate. But while your old dad is still around I thought I’d try to give you some life advice in one go. I hope it gives you some comfort. I hope cancer never returns so that your life is long, fulfilled and happy. Everyone will say it’s vital to work hard at school. Hopefully you’ll always do your best. I did well at school but did it do me much good in life? Not really. School work IS important, but make sure you have fun too. At the moment you don’t make much distinction between girls and boys and see all children as friends. That’s typical of your sweet nature. But Kel, that will change as you get older. You might see them as stinky, pesky classmates in a few years’ time. But, probably at secondary school, you’ll realise they can be quite nice. You’ll have boyfriends when you’re older – MUCH older hopefully! – and I won’t be here to grill them about their intentions. So here’s some advice from your old man. It’s very hard to describe how it feels to really be in love. You might remember seeing me and your mum laughing together and cuddling on the sofa, and once the love hearts and flowers fade that’s what real love looks like. Have fun finding it. Always choose boys with gen­tlemanly values, manners and respect. Imag­ine them having tea and a chat with our family around our table and if you think they’ll fit in, you have found a decent young man.Sadly, you will have your heart broken one day. It hurts like hell and will feel like the end of the world. But you will get over it. And even if a romance doesn’t work out, try to be kind. Boys have feelings too. Lastly, if you have a special boy pal who is always there for you when boyfriends come and go, don’t take him for granted. Don’t overlook him. He might really care for you. I often dreamt about your wedding day and imagined filling up with tears as I walked you down the aisle before giving you away. I won’t be able to do that Kelli. Sorry sweetheart. But I will be looking over your shoulder on that day, proud and happy you have found a special someone to love you and care for you.I wonder if you will play what you call “the family song” (which is really I’ll Be There by The Jackson 5). It meant so much to me and my brother and sister growing up, and I know it does to you too. I’ll be there on your wedding day in spirit. You and your mum will argue at times, especially when you’re a teenager. Please remember she adores you and wants the best for you. Give Mummy a hug when she is feeling sad and help each other get through any horrible times when I am gone. When you’re a teenager you might think your friends are right and your mum is wrong. But she has to make hard decisions for you and, more than any friend you’ll ever have, has your interests at heart. Treat her well. Nothing is more important than family and the values they give us. Nothing. Treat people as they treat you. Be nice to anyone who helps you, always. Bullying is horrible – never become one. On your first Christmas without me, I’d love if you and Mummy would light a candle and remember me for a few minutes. It would be great if you two did the monkey dance together. Jumping around shaking our bottoms always made us laugh. That’s something to make me smile from up above. I’d also love if you visit my parents on Boxing Day. They will be hurting too.I’ve given Nanny Sue presents for all your birthdays. I wish I could be there to see you open them. Hopefully you will like everything as it’s hard to imagine you at 10, 15, 20. I wonder if you’ll still like One Direction. I wonder if they’ll still make you dance around the living room. You were two when you told me you wanted to be a “princess astronaut” so you could wear nice dresses and find new planets. You might now realise that’s not possible. But so many things ARE possible for you, darling. Do what makes you happy and that you enjoy. If you do so, life suddenly becomes much, much easier. You may need to start a few different careers to find the one you enjoy, but so be it. One life, one chance. Most dads teach their daughters to drive and usually fall out in the process. Make sure you learn how to drive as soon you can – it opens up the world for you. Also, make sure Mummy doesn’t teach you (just joking, Joely). It’s a cliche to say travel broadens the mind, but it’s true. See as much of the world as you can. But never on a motorbike (too dangerous). You never laugh at 50%: you always laugh at 100%. Your laugh takes over your whole body and is highly infectious. I hope you never lose that. There is no point in asking you not to be sad when I go. I know you will be, princess. And I wish I could be there to wrap my arms around you and snuggle you until you smile again. Remember the Eeyore teddy I bought you from a charity shop? You said you’d keep him safe and cuddle him when you miss me. That’s a great idea. You can feel sad and use it as a driving force throughout your life. Or you can just be sad. You know which one I hope you choose. Please give to charities. Charities have been good to you and I. You’ll probably always remember our trip to Disneyland. But I’ll never forget the sacrifices people made to pay for your healthcare if ever cancer returns. Elderly people sent prayer cards and £10 notes they couldn’t afford. Heads were shaved, miles were run, thousands were raised. All for you. It’s important to pay back. Doing good deeds uplifts the soul. Never forget there are people worse off than you who you can help. Always keep trying. You might remember that I taught you to say “giving up is for losers”. I failed a number of times in my life but never gave up. Kelli, never give up. In life, many people will say you cannot do things. You make up your mind. Can you? Do you want to? Big challenges involve risks so make smart choices. Those who told me I couldn’t do certain things didn’t want me to do them. If you want something, it is nearly always possible, so do your best. I’m sure there’s a hell of a lot you can achieve!I know you will make me proud and do something great in my memory. I know you can do it – so let’s start now. And finally... Thank you for being you, Kelli. Thank you for paying me the biggest compliment of all time by calling me Daddy. Having you as my daughter is the greatest honour of my life. Thank you for teaching me more about love and happiness than any other person.Enjoy your life. Don’t rush through it. I will be waiting.